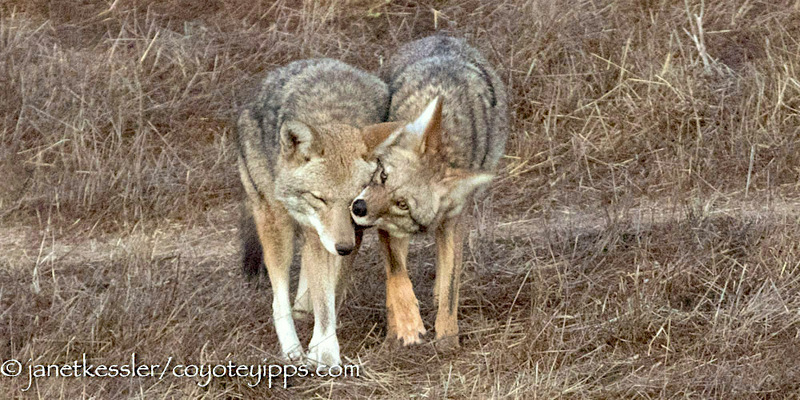 In this posting, I want to show the amazingly joyous tuned-in camaraderie, if you will, that is displayed between these two coyotes. 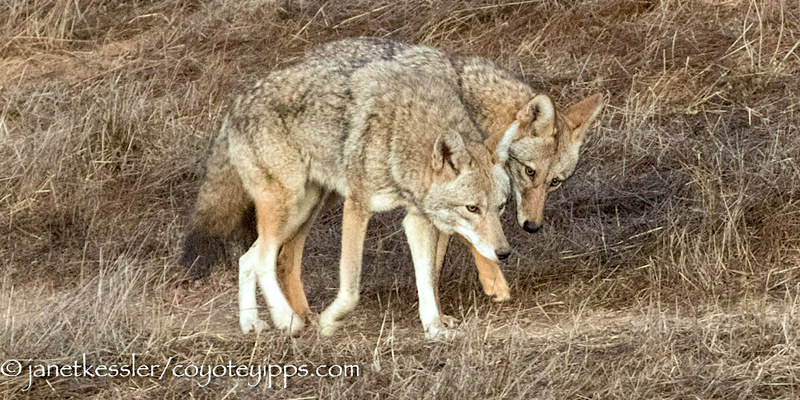 The rapport is fascinating, with the coyotes not only walking side-by-side, constantly looking at each other, and even hunting alongside each other, but in addition, you can see that they are blatantly thrilled with each other’s company! They are in-tune to each other’s moods and intentions, and they both are on the same wavelength as far as their “togetherness” is concerned. 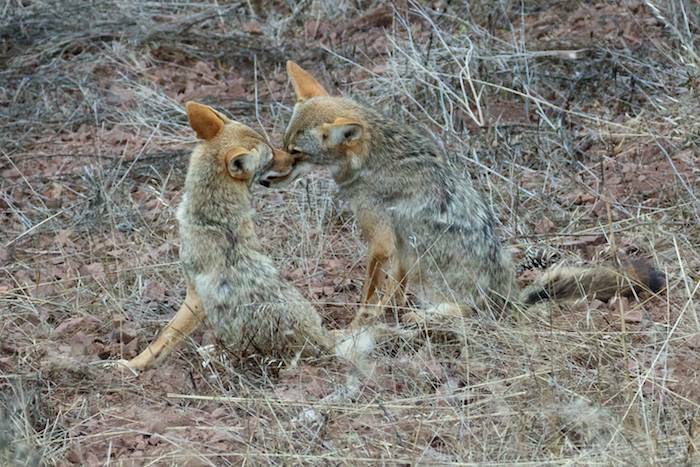 I don’t remember ever watching two adult coyotes getting to know each other like this. 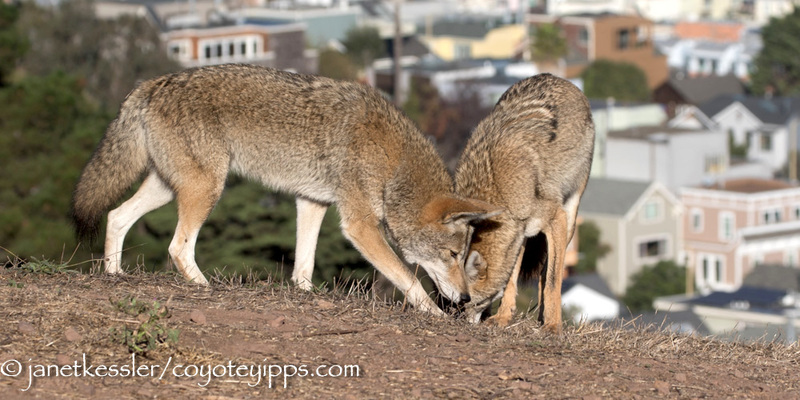 In all the pairs I’ve been observing, I either came to an established pair, or siblings became a pair, or a youngster moved into a vacated adult position caused by a death — yes, there is a lot of inbreeding in coyotes, at least in San Francisco. 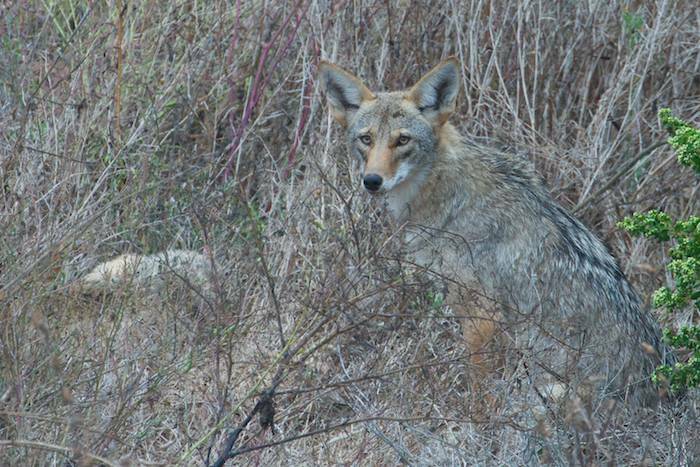 But now I have an opportunity to document coyotes getting to know each other from the word “go”. The pair just met a couple of months ago when the dispersing 1.5 year-old male appeared on the doorstep (footpath?) of the 3.5 year-old loner female’s territory: she had been living all alone there for three years, so this has been a huge change for her. She welcomed him right from the start. From the beginning there was a lot of eye-contact, and snout-touches, but initially there was also tentativeness and carefulness which over the weeks has morphed into uninhibited displays of “oneness” and affection as trust has grown. The photos show the magnetic draw between these two through their warmth and enthusiastic reaching out for contact and even play-bites: these are “I like you” gestures. As an observer, I actually feel their affectionate engagement between them. Meeting “that special friend” is something most of us can relate to! 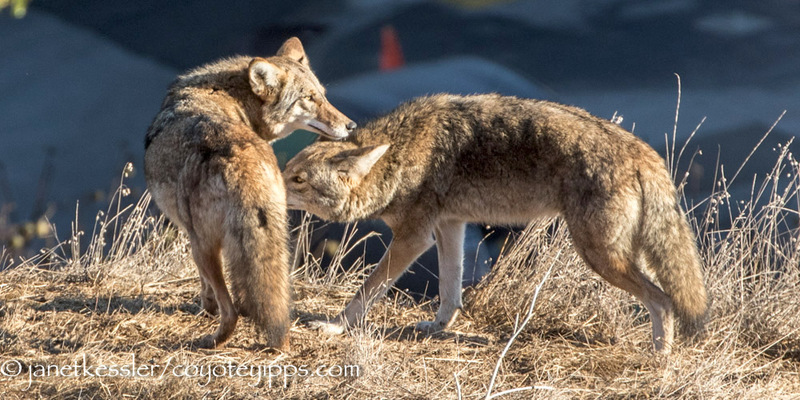 My next posting about these two will be about their “checking in” with each other after a short period of being apart, with teasing and fun between them, which are what coyotes use to show each other how much they like each other, and how at-ease they are with one another. Allowing him to share her “find”. 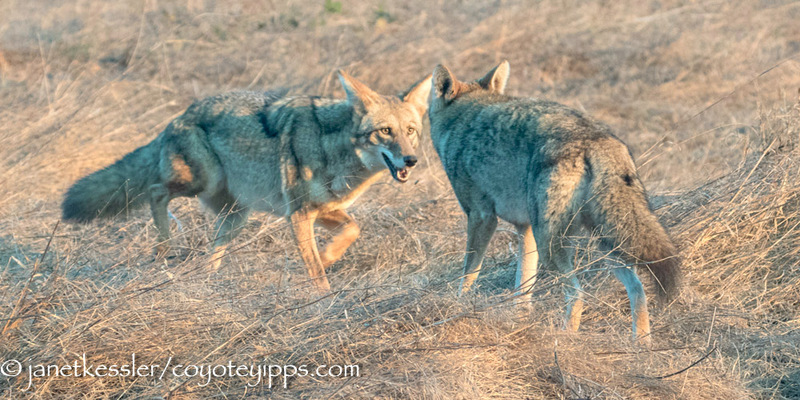 I have added to my Introductory Pages a writeup of Coyote Voicings — Yips, Howls and other Vocalizations: a Panoply of Sounds and Situations. 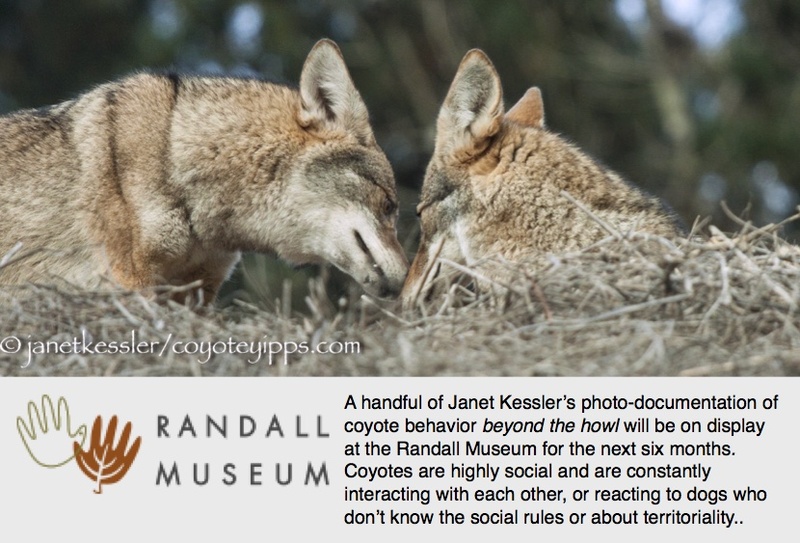 Summary: Coyote communication occurs mostly via eye contact, facial expressions and body language and it can be very subtle. Coyotes are not forever vocal as humans are; they tend to be on the quiet side — except when they aren’t! Here I explain their voice communications, based on my own daily dedicated observations over the past 11 years, and then I give about 20 examples, chosen from about a thousand that I’ve recorded. Teasing and provoking by pulling on your friend’s leg or neck, ducking and evading, a swing to the left and another to the right, baring your teeth and lowering your head — all the while keeping your ears in a low, non-aggressive position. 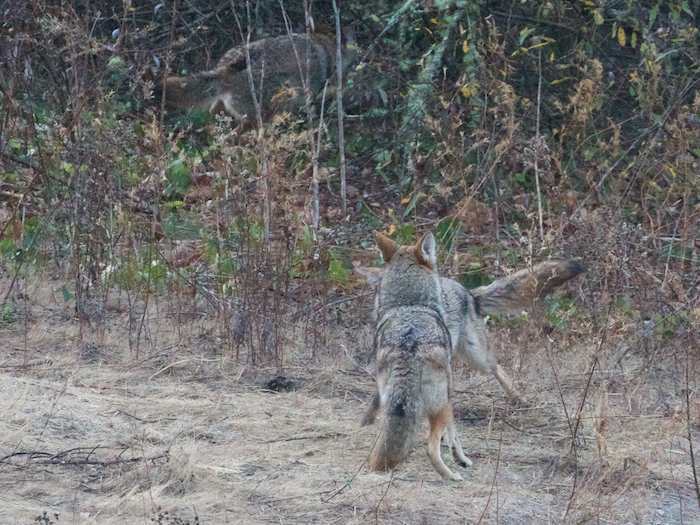 This is how coyotes play, and they usually do so at their *rendezvous*: after spending daylight hours sleeping and apart, they come together for their social activities around dusk time. Afterwards, there is a grooming session, where they accept the grooming caresses from each other as they calm down. This play can involve a mated pair, it can involve a parent and a pup as long as the pup shows proper obeisance, and it can involve adult siblings who actually live apart but continue their childhood relationship for a while. 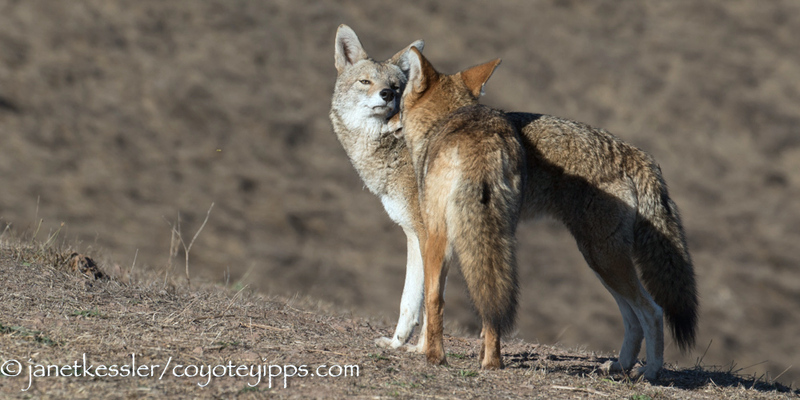 Coyote pairs are becoming cozy again. It’s that time of year. They are spending more time together than in the last few months. Most of the time, both partners appear to be mutually involved — mutually attracted. But I wonder if this is always true? I watched as the male (right) of this mated pair came out of the bushes and approached the female who was lying in the grass. Rather than joyful greetings when she saw him coming, she put her head down in a manner of *resignation* and waited. The greeting ritual here involved dominance on his part, and some kind of trepidation on her part. It was not the “ever so happy to see you” excitement that I’ve come to expect from other coyote pair greetings, even though those, too, involved a degree of hierarchical activity. 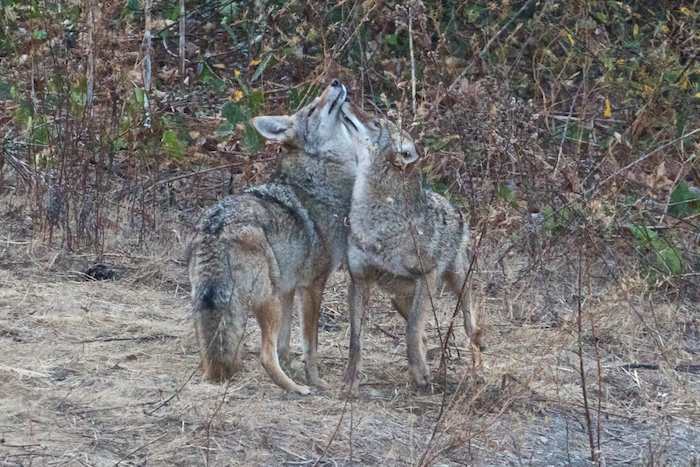 I wondered how often coyotes are in relationships that aren’t mutually desired? This female seems to like her independence. She spends time alone on a hill where she hunts or rests curled up in a little ball. He, on the other hand, keeps himself less visible by spending time in the bushes during daytime hours. Whereas she always takes off to walk and explore on her own, he has a need to shadow her or wait for her, and when he looses her, say because of dogs or people approaching, he’ll look for her for a short time and then head back to his bushes at a slow and listless pace with head slumped down — one can’t help but read this as disappointment and dejection. Of course, they’ll meet up later in the evening, but he obviously wants to go trekking with her. She doesn’t seem to really care, and makes no effort to locate him after they get separated. 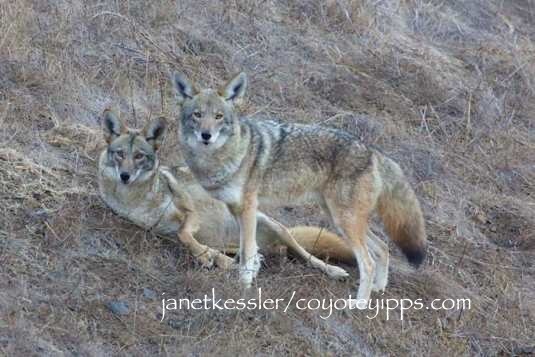 Janet and I have written about coyote family daily meet ups, rendezvous, and in a past post I included a short video of one: https://coyoteyipps.com/2011/07/24/rendezvous-by-charles-wood-2/ . The coyotes act like they haven’t seen each other in days when it has only been a few hours. It’s so joyful! The other evening I was listening to Krista Tippett interview Katy Payne, an acoustic biologist and founder of The Elephant Listening Project. Here’s a link to that interview:http://www.onbeing.org/program/whale-songs-and-elephant-loves/24 from Krista’s On Being web site. About 22 minutes into the interview Katy describes elephants family rendezvous greeting sessions that are very similar to those of coyotes, including the tail twirling. As with coyotes, elephants show the same joyfulness after having been apart for a mere few hours. Incredible! Imagine yourself as a young coyote in a perfect world. You live in an urban park which is ideal as a habitat — ideal beyond imagination: there are forests of trees with thick undergrowth for protection, a lake and streams with fresh water, open fields for hunting the overabundance of gophers and voles, there are snails and fruit to eat, there are dogs passing through which provide you with visual entertainment — even if some of them go after you, and you are protected by a city which encourages coexistence and does not allow trapping and killing of its urban wildlife. Pretty fantastic! 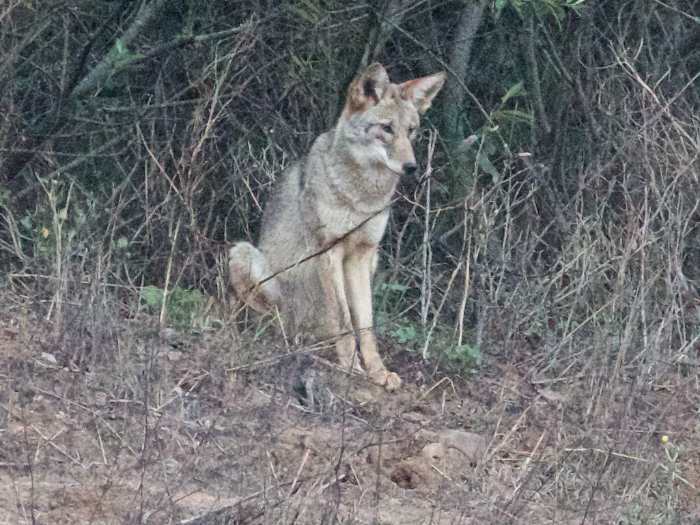 It’s true that nasty rumors and myths about coyotes spring up now and then which could result in harm to you, but most are short-lived and, more and more these days, the misinformation is brushed aside by a majority of park goers who have learned about coyote behavior and know that the sensationalist stories are all hype. Family life, too, is ideal. You live with a father who has raised you and cared for you, and you have a sister who absolutely adores you as much as you adore her. You spend hours together, grooming each other or exuberantly playing all sorts of games you’ve invented for yourselves, such as chase and catch, tug of war, wrestling, steal the meal, jump over one another, hide and seek. Life is really a blast, and it’s been this way for the entire 16 months you’ve been alive to enjoy it, except the brief interlude immediately after Mom went missing — but you were young and that was soon forgotten because Dad was there to carry on for you. Things would have to be really, really bad for you even to consider such a thing as leaving. But life is not static: we all graduate to new levels and must go on at some point. Life is ever-changing and change is occurring now, not because of anything you’ve done, but because of who you are. You are a young male, and any territory only has room for one adult coyote male. Dad is feeling your coming-of-age and his instincts are becoming stronger, day by day, to push you out and away from his turf. Recently, Dad has been charging at you, coming at you like a bullet to kick or nip you. You submit always and quickly, but that isn’t enough sometimes. More and more, you’ve been staying out of his way. You don’t join him and your sister so often, and you spend your time more and more alone. However, you have strong yearnings to be with your sister, to play with her, to exchange mutual grooming and care, after all, you are a very social creature, and family life has been an integral part of your life since birth. Recently, greetings with her have changed to include sniffing and having one’s underside sniffed — something new is going on. Sister has found herself in the middle. By loving and playing with you, her brother, she’s inadvertently hindering her father, it seems. When she sees the antagonistic behavior of her father, she does her best to keep the peace, running interference, by interjecting herself between the two males to divert Dad’s attention by grooming him (Dad) or sticking her muzzle in his — and it works. After, or even before, taking care of Dad, she approaches you with her warm and affectionate greetings, and then she plays with you wholeheartedly, and Dad seems to accept that he must let her be this way, so you still hang in there, at least for now..
We all know how this is going to end, and it is definitely heartbreaking to watch the process. The Dad’s dispersing ritual is happening more and more frequently. Yesterday I saw the process again — it’s in full swing. Dad and Sis had been out foraging, and began heading off on a trek when the yearling male — her brother and his son — appeared out of the bushes. He had kept apart and away, but was very aware of them as revealed when he tried joining them on the trek, albeit tailing them at a considerable distance, possibly so as to avoid detection by Dad. There was such a pull to be with them. But the minute Dad saw him, he, Dad, launched himself in the male youngster’s direction, charging at him, punching with his snout, nipping, kicking and turning him over on his back. This intense attack happened in tall grasses, which prevented me from taking clear photos. At the beginning of the encounter I heard an unusual, never heard before, short throaty snarl or gnarl. It was a warning of some sort. And I don’t know if the attacker or the defender made the noise because they were partially hidden from view. Besides the gnarly snarl, there was flailing in the grass, running off a little and more flailing in the grass. When they emerged enough for me to see them fully, Dad was walking away from male youngster, and youngster was keeping his distance from Dad but following, not fleeing. Young male desperately wanted to join sister and dad for the family trek. When the warm sibling greetings were over, Sis ran to catch up with Dad, looking back invitingly for her brother to come along. She loves her father as she does her brother. She approached Dad and engaged in grooming him while he looked back over his shoulder, glaringly at the younger male, his son: “do not come”. But the male youngster did come, with Sis encouraging him. Sis no doubt sensed the tremendous tension between the males in her family probably without comprehending any of it, and so, possibly in an attempt to dissipate it, she dashed off as if in hot pursuit of prey, enticing the others to join her and in the process to forget their strife. It kind of worked because they now were concentrating on other things, on hunting in the forest. Then, sirens sounded and they all howled together — was the spat over? I don’t think so. Dad then walked on, all alone, without being joined by either of the two youngsters. That is the last I saw of him that evening. Had he lost the skirmish? Even if he had, he won’t loose the battle — he’s a five year old mature male, and his son is just a 16 month old ingenue. Sis went off hunting, and young male was left standing on a path looking for her. Not being able to locate her, he headed off in a direction opposite from the one his father took, looking dejected as revealed by his slow pace and lowered head. But Sis must have had her brother in mind. She picked up his scent and caught up with him. There was warm body contact, nose touches and wiggles, and Sis put her paws on his back again — was she showing who was boss? Or was this just her way of showing affection — this last is what appears to be the case. It now was dark so I had to leave. I had witnessed an episode of a dispersion process, where a parent forces out a youngster from his territory. Young Male will eventually have to leave. But I wondered if Sis would stay on the territory with Dad, or if she would go with her brother? I wondered if Dad’s attacking the male youngster would in fact have repercussions of driving out Sis as well. I’ve already seen where both youngsters now flinch in anticipation of Dad’s antagonism: the young male from being on the receiving end and Sis from simply observing it. This dispersion process has been going on for some time — it’s recently reached a crescendo. I’ll post if things change. 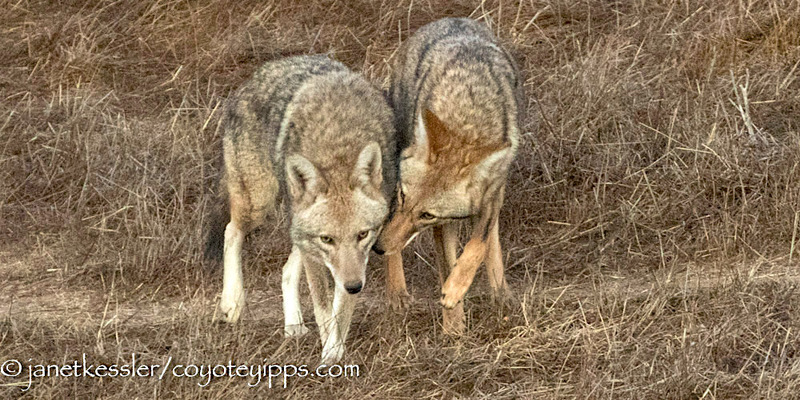 A couple of days after I had videoed a mother coyote lashing out at one of her seven-month old pups — a female, I witnessed a change in behavior between two of the pups towards their mom. These are both females, though I have no idea if gender had anything to do with what I observed. I watched as Mom came into a large field where three of her pups were absorbed in foraging in three different spots. All pups stopped their foraging activity immediately when they saw her. Two of the pups dashed like bullets across the field in her direction. One of the pups that dashed in her direction, the male, went straight up to her, as always, to greet her, tail flailing with excitement. There were the usual kisses and wiggly little excited movements that indicate all is happy and well between them. He attempted getting food from her, but she had none to offer, and it didn’t really seem to matter. Interestingly, the second pup, a female, who had also headed in Mom’s direction, went straight past Mom — who was in the process of greeting the male pup — and into the bushes! She did not stop to participate in the happy greeting which I had always seen her do before. Hmmm. Was she afraid of the mother, having seen the harsh treatment dished out to the other daughter? This would be my guess. All of these are new behaviors, beginning with the lashings of the one daughter, and I can’t help thinking that they are all related. 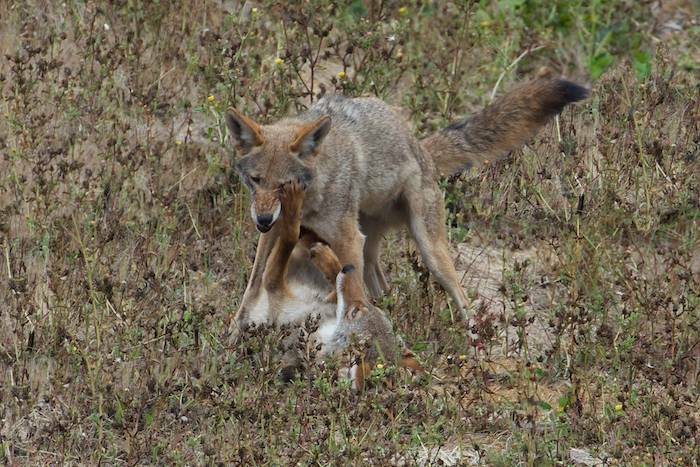 The female pup who had received the lashing did not head towards the mother coyote. Even though she was a long distance away from where Mom entered the field, she ran into the bushes closest to her and hung out there, hidden, for a few minutes. Eventually she came out of her hiding place, sat down, and just watched from about 400 feet away — she had no interest in approaching her mother. She looked sad to me. The mother looked at her for a moment, and eventually moved on and out of sight. Not until then did this daughter continue her foraging before heading into the bushes for the day. 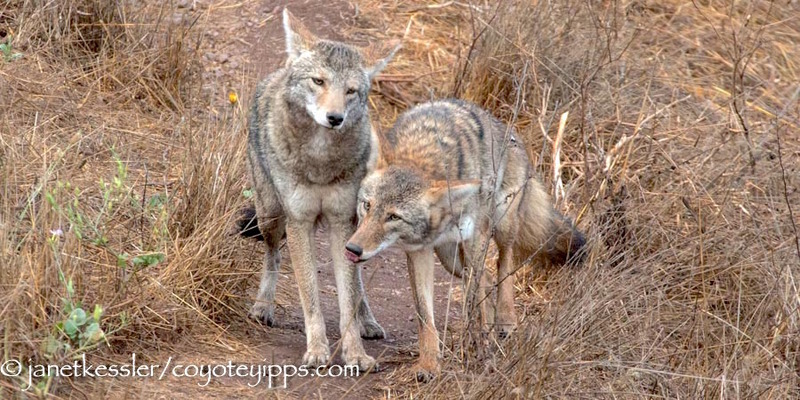 There is always communication when coyotes look at one another. I wonder what information their “look” conveyed.